All the kids come running for the great taste of possession. Six Millennial friends try to contact unseen entities supposedly haunting an old house where murders were committed. Where have we heard this before? Oh, everywhere… There are a couple of interesting tidbits thrown into this mix of horror and detective thriller, but for the most part, DEMONIC has a devil of a time coming up with anything original. Dustin Milligan is John, whose mother was murdered in that house. He’s the skeptic, urged on the trip by his pregnant girlfriend Michelle (Cody Horn). 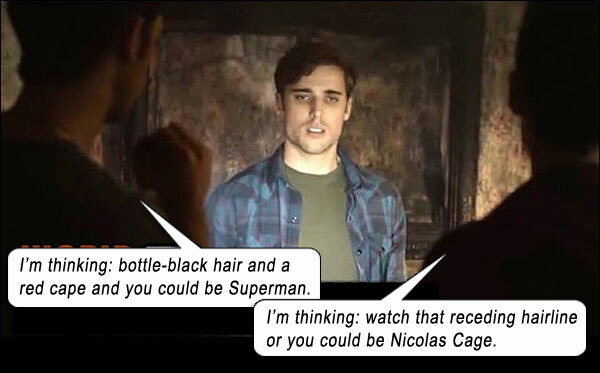 Milligan first came to my notice when he appeared as the young gigolo on Mike Judge’s EXTRACT; his face has matured and he’s now at the resemblance crossroads – either he’ll grow up to be Superman, or Nicolas Cage. (Then again, Nicolas Cage was almost Superman, so, uh-oh…) And Horn came to all men’s notice when she appeared almost naked in Channing Tatum’s roman a clef MAGIC MIKE. Aaron Yoo sets up cameras and sensors in the house; he’s the computer guy because – Asian. Scott Mechlowicz is Bryan, leading the expedition, and Megan Park is Jules the blond fluff. There is another guy brought along for the same reason STAR TREK officers beam down to planets with nameless janitors. The kids prepare for their “evocation” – is that the Millennial word for it? Not kewl enough to call it a “séance” anymore? – while all manner of disturbance plays out around them, mostly that old trope of seeing horribly disfigured entities peripherally, and being grabbed by unseen things in arbitrary jumpscares, which are all starting to sound and look exactly the same in every “horror” movie. And why does the jumpscare entity have to be horribly disfigured anyway? As John’s story unfolds, we find out there was a demon in the house, kept prisoner by a rune scratched into the floorboards, and it needed a warm body to possess so that it could escape its bonds. If that’s your storyline, writers, then stick to it. Now the demon has seemingly possessed Michelle’s unborn baby, yet it has taken another form and is whining that it can’t find Michelle amongst all the murdered kids to ensure that she has survived and therefore that IT has survived in her womb… But wait: what are you doing outside her womb in another form anyway? Isn’t this demonstrably a form of escape from the house? So you can be in two places at once, and outside the house, and you’re still looking for a baby in a womb because you’re supposed to be in there awaiting your escape into the outside world? And if you’re in there possessing that fetus, wouldn’t you already know it? – I mean, you’re a demon! – or do you revert back to the cognizance of a fetus? And thus, like a tree rotting from its roots and falling on a shiny car, DEMONIC fails in its basic plotline, which informs everything else in the story. The slight interest that was piqued by serving up the story in non-chronological order is pointless. Story is ruined by its own illogical writing. Dustin Milligan is well on his way to becoming Nicolas Cage. Writers: Will Canon, Doug Simon, Max La Bella. Starring: Maria Bello, Frank Grillo, Cody Horn, Dustin Milligan, Scott Mechlowicz, Megan Park, Aaron Yoo, Alex Goode, Terence Rosemore.